I would be willing to bet that Alexander Pruss is one of the most intelligent persons in the U.S. Dr. Pruss is a professor of philosophy at Baylor University. He is a devout Christian and a member of the Catholic Church. I’ve read a few of his philosophical papers, but the main way I know about Dr. Pruss is through his blog –– Alexander Pruss’s Blog. Many of his posts are fairly technical, and he often covers topics that are probably only interesting and understandable to those who have studied contemporary philosophy. So the average reader might not enjoy them. But I still think his thought is so deep and so rich that it is worth it to follow his blog. Those who have no interest in contemporary philosophy will occasionally find a blogpost that they find interesting and helpful. Now that I’ve introduced Alexander Pruss and explained why I think so highly of him, let me share with you some highlights of a recent post on his blog. From his knowledge of the pro-choice movement, Dr. Pruss says that he has noticed that philosophical pro-choicers (I don’t think he’s limiting this group to professional philosophical arguments but instead includes anyone who knows the details of the philosophical defense of the pro-choice position) and lay pro-choicers give different answers to two questions. 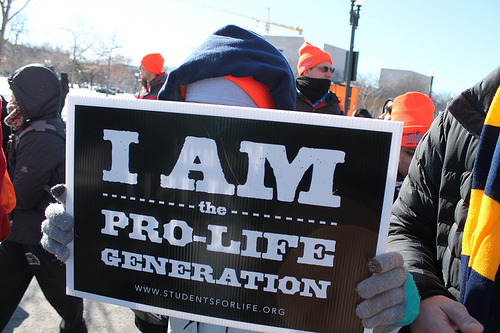 Even more interesting, Dr. Pruss says that the philosophical pro-lifers and philosophical pro-choicers would answer these two questions the same way. So there are two questions that philosophical pro-choicers and philosophical pro-lifers would answer the same way but that lay pro-choicers would answer a different way. Dr. Pruss says that he thinks that philosophical pro-choicers and the philosophical pro-lifers will both answer “Yes” to these two questions. Both would be willing to grant that a fetus has the “same intrinsic moral standing” as a newborn. (In the article, he says that “fetus” could be qualified to “fetus with brainwaves” or something like that and his insight would still hold true. Both would be willing to see fetuses as part of the human species. The lay pro-choicers, he thinks, would answer “No” to these two questions. This is a clue that the philosophical pro-choicers are pro-choice for reasons that differ fairly substantially from the reasons that lay pro-choicers are pro-choice. If Dr. Pruss is correct, then many of the lay pro-choicers would not be pro-choice if they thought the appropriate answers to these two questions were “Yes.” In other words, some lay pro-choicers would no longer be pro-choice if they had the same views on these two questions as the philosophical pro-choicers. If he is right about this disconnect among the pro-choicers, then this could signal that many people would become pro-life if they came to see the answer to these two questions in the same way as the philosophical pro-choicers. In other words, this can be influential in how we set our strategy for the fight for the pro-life position.